Affable and affordable, Portugal offers a perfect opportunity to catch that perfect wave- or just to catch some rays. February is a month for fantasising. The Christmas holidays are a memory and the Irish summer is a future dream, if not a complete illusion. I’ve been comforting myself with thoughts of Ericeira, a small Portuguese town I visited last September with a new Irish travel company, Surfholidays.com. It’s a traditional fishing village located 40 minutes drive north of Lisbon in an area known as the Silver Coast. But despite its proximity to the Portuguese capital, the town remains remote. A few apartment complexes have sprung up around the outskirts, but its old-town centre retains its distinct charm. The labyrinthine lanes and narrow streets wind down past the tiled doorways of the white-washed and red-bricked buildings towards the town square, then sweep towards the seafront, where a view of the nine different beaches that Ericeira offers can be seen tucked in at various angles from the coastline. For the novice surfer, the coastline is a formidable collection of craggy rocks and tiny inlets. In fact, surfing itself seems and alien culture, with its own rituals (waxing, retouching and christening boards), language (bailing out, feathering and hitting the lip), as well as dress codes (sun-bleached hair and exposed torsos are a must). However, Ericeira has beaches that can accommodate surfers of various skill-sets and with a little friendly guidance from the highly-skilled instructors (the ‘dudes’) the novice will quickly pick up on codes of communication, even if the surfer’s six-pack still eludes them. Ericeira is the most famous surf-spot in Portugal and southern Spain because of the variety of surfing opportunities its different beaches present, as well as the consistency of the surf on offer. In fact, the World Qualifying Surf Championships are held there every August on the Riberia D’Illhas, where the safe reef provides brilliant view points. The world-famous ‘pointbreak’ (that’s a perfect wave to you and me) at Coxos is the also visible from the beach. Foz do Lizandro is the main beach and the most popular with beginners, where the large stretch of sand is flanked by a new promenade and a couple of surf schools double up as restaurants and bars. Although temperatures in the area in September average 25 degrees, rising to 30 – plus in high summer, the Atlantic offers a refreshing wake-up shower before 9am lessons and a cooling soak in the midday heat for afternoon sessions. The waves are strong too, and the walk out to the reef can be a struggle, but once you mount your board (or rather, once you get the hang of mounting your board) it can be quite peaceful bobbing along and allowing the dip and curl of the waves to move you to and fro across the coastline. Okay, lying on your belly on a surfboard is not technically surfing, but the real deal is pretty difficult and tiring. The surfholidays.com instructors are highly skilled and very willing to work patiently with novices, providing them with wetsuits and surfboards as necessary too. The first lessons begin on the beach, where you are brought through the technical aspects of riding the waves, many of which revolve around safety. Falling off your surfboard is inevitable, both for pros and beginners, but it’s important to know how to fall properly to avoid being attacked by seven-feet of heavy lacquered fibreglass as it follows you under the waves. After practising mounting the board on the sand for a while, you are brought into the water and keenly supervised as you get up and get knocked down again and again, until you finally get the hang of it. It requires a certain amount of bravery and a good amount of strength to succeed (after three lessons, I confess, I stood only for about five seconds) but it is brilliant fun and a great test of fitness and stamina. The water buoyancy absorbs much of the physical exertion, and sheer concentration distracts you further from the physical trials, but afterwards, sprawled on the beach, there is a real sense of achievement as your abdominal muscles, arms and legs relax again in the drying heat. Ericeira has a lot to offer for evening entertainment. There are many good restaurants, and, needless to say, seafood is a speciality. The local Portuguese wine is also a revelation – the vino verde or green (young) sweet white whine is particularly refreshing after a hard day’s activity. Portugal is also even cheaper than Spain – a beer costs €1 in most places, a glass of wine €1.20, and the food is also reasonably priced. Ericeira also has its share of late-night drinking and dancing venues, including Ourico, the second-oldest nightclub in Portugal, which overlooks the Atlantic. Lisbon is within easy reach by bus, car or taxi for a night out in the city. However, it’s also worth a day trip, as the centre is a stunning mix of history and modernity, as well as a shopping mecca. Also nearby is the UNESCO World Heritage town of Sintra, with its stunning summer palace and 8th century Moorish castle, as well as the ancient monastery at Mafra. 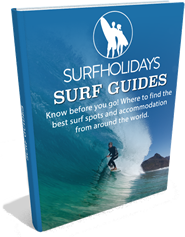 Surfholidays.com offers a range of accommodation options for a variety of budgets, including beach and ocean apartments and town’s four-star spa hotel. One of the best options is the Eco-lodge complex, a small private complex in which five two-storey wooden huts are located. Each Eco-Lodge features two bedrooms (sleeping four), a kitchen, a walk-in power shower, a veranda and a suntrap balcony complete with hammock. The lodges overlook the communal eco-pond, patio, barbecue and vegetable garden, while a long basement area provides shelter, a dining area and multimedia entertainment. The Eco-Lodges would be a perfect setting for a large extended family holiday or a big group getaway. Surfholidays.com also offers surfing holidays throughout Spain and France. Hossegor, north of Biarritz and known as Europe’s Hawaii among surfers, and Noja, nestled between Santander and Bilbao, are two of the most popular alternatives. However, for hardy adventurers unwilling to go abroad, Surfholidays.com also offers accommodation and tuition in Bundoran, in Co. Donegal and Lahinch in Co. Clare, the spiritual home of Irish surfing, where you’ll find out just how cold the Atlantic can really get.